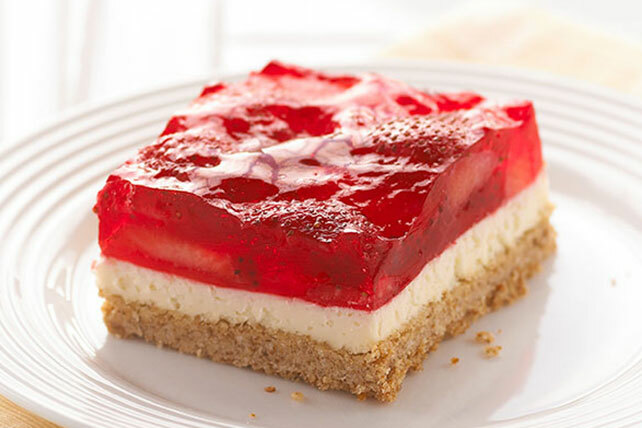 Eat smart with fluffy Strawberry-Pretzel Salad Dessert Squares! A crushed pretzel crust keeps these Strawberry-Pretzel Salad Dessert Squares interesting. Mix pretzel crumbs, 1/4 cup sugar and margarine; press onto bottom of 13x9-inch pan. Bake 10 min. Cool. Beat Neufchatel, remaining sugar and milk until blended. Stir in COOL WHIP; spread onto crust. Refrigerate until ready to use. Add boiling water to gelatin mix in large bowl; stir 2 min. until completely dissolved. Stir in cold water. Refrigerate 1-1/2 hours or until thickened. Stir in berries; spoon over Neufchatel layer. Refrigerate 3 hours or until firm. Substitute 1 cup fresh blueberries for 1 cup of the sliced strawberries.